Our 2018 Road Trip, Part 10: Tea Time for Activists « Midlife Crisis Crossover! She fought for women. He fought for blacks. Together, they fight crime! Our tour of the National Susan B. Anthony Museum & House wasn’t the only highlight of our Rochester detour. Across the street sits another tribute to the titular champion of women’s voting rights. 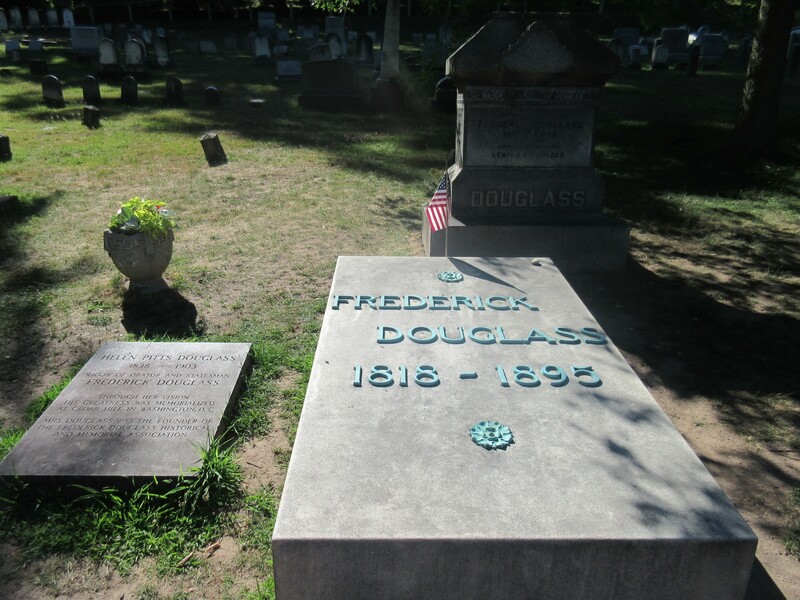 Alongside her is a great man, a close friend of hers, and a well-known name in other circles then and now: the great abolitionist and author Frederick Douglass. This way to tranquility and tribute. 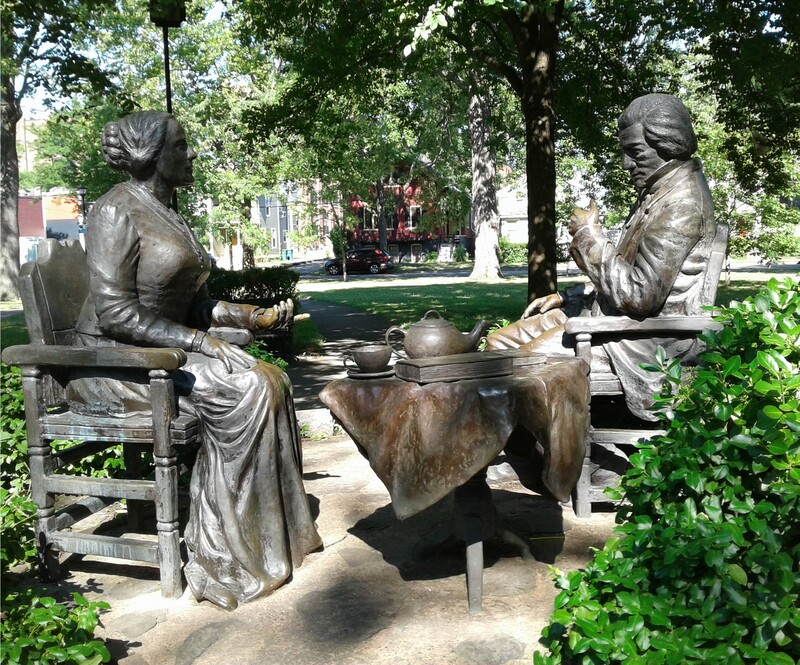 The small park’s centerpiece is the above-pictured pair of bronze statues, a team-up of rights champions entitled “Let’s Have Tea”, the work of Laotian artist Pepsy Kettavong. Most sites indicate a 2001 completion date, but the sign on location reads “1998-2002”. 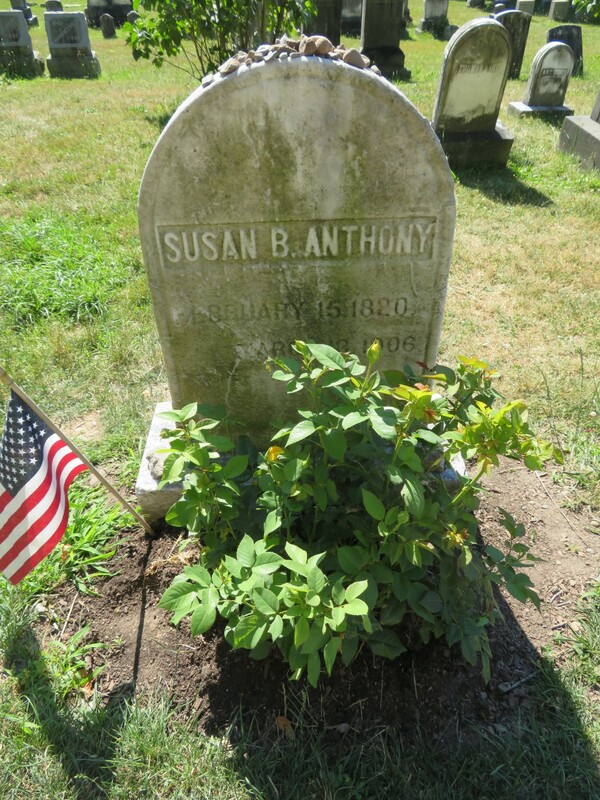 In real life Anthony’s parents introduced her to Douglass, and the two became friends and frequent partners at the same speaking engagements. He was one of many recurring visitors at her house along with other suffragettes, and printed the first copies of his newsletter The North Star in her basement. 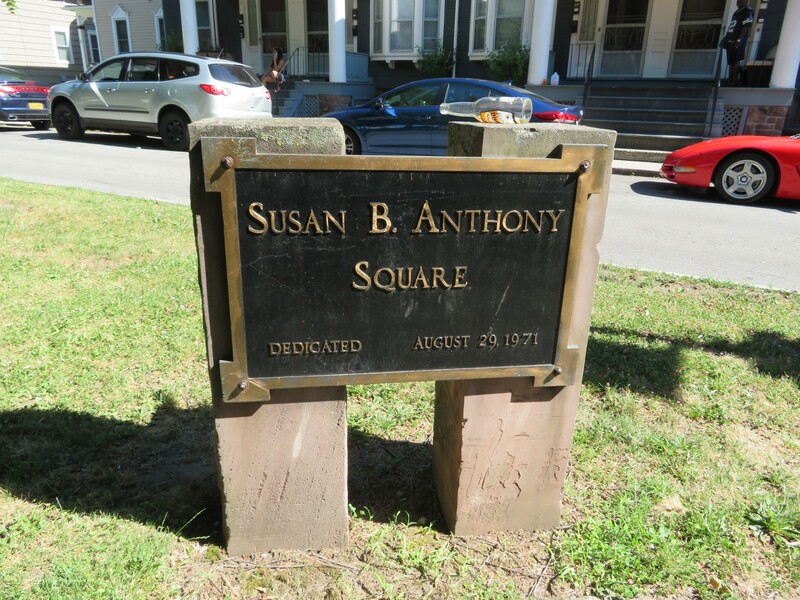 Susan B. Anthony Square on a Sunday afternoon. 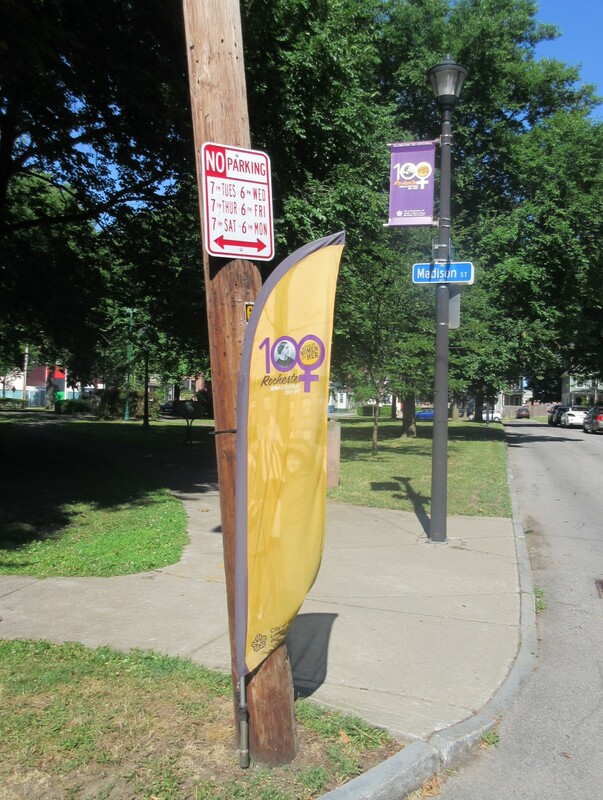 Decorating the perimeter are signs that celebrated last year’s centennial for women’s voting rights in New York, having been granted three years before the 19th amendment legalized them nationwide. 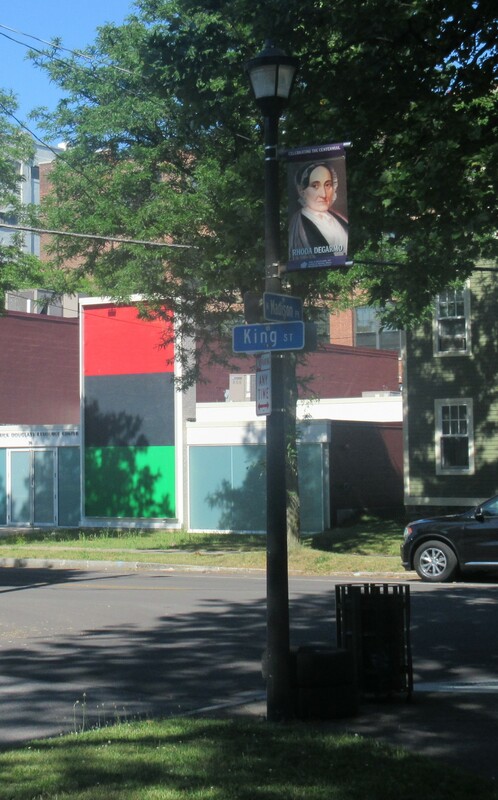 Banners saluted a selection of collaborators such as Rhoda DeGarmo, a suffragette who was among those arrested with Anthony after Election Day 1872. She also organized anti-slavery fairs and was part of the Underground Railroad. The other side of those statues, facing away from the sun. The dark side of tea time, as it were. Our departure was set back a few minutes when I started the car and the dashboard immediately insisted, “COLLISION DETECTED.” Accompanying the message was a drawing of a tiny explosion. An inspection of every side of the car turned up no signs of bumps, scrapes, or soot from an actual explosion. Once again the fancy dashboard tried to be helpful but wasn’t. Best guess: love tap from some passing motorist. All I know is the rental company didn’t hit me with a surprise body-shop charge later. 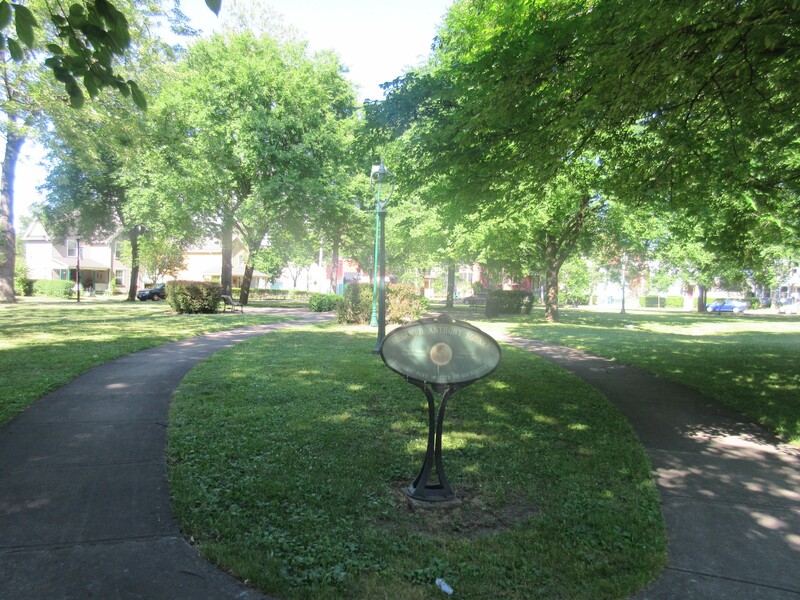 Anthony and Douglass died eleven years apart, but their final resting places are only three miles down the road from the Anthony House. Rochester’s Mount Hope Cemetery was dedicated in 1838 and was the hilliest of all the cemeteries we visited on this vacation. A few other famous personalities lie there as well — e.g., the man who founded the company that owns our local newspaper, along with both Bausch and Lomb, the kings of eye care. However, after spending so many hours that morning in Buffalo, especially in their own cemetery, we hadn’t left ourselves enough margin to entertain too many more extra-credit cameos. 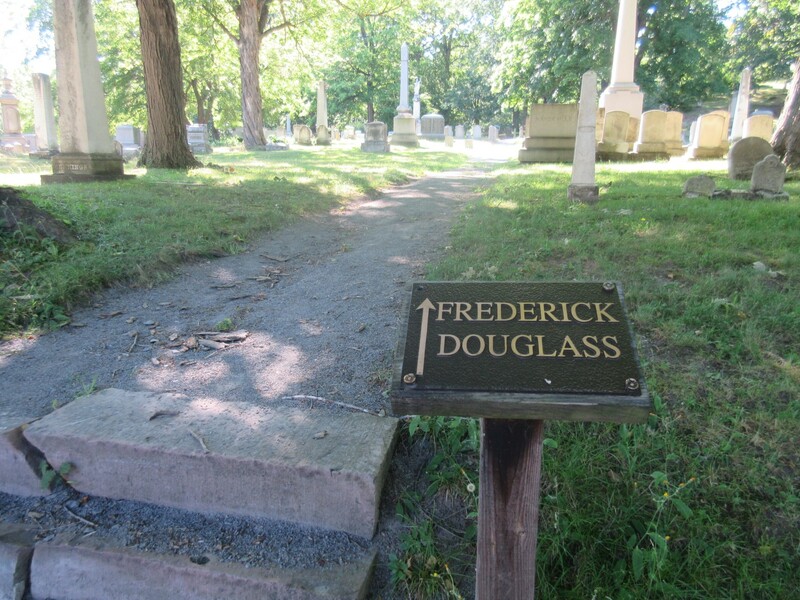 Even though they weren’t perfect fits for the “Presidential burial site” theme of this trip, at the very least we wanted to visit Anthony and Douglass before moving on. Old chapel and crematory lying just beyond the entrance. 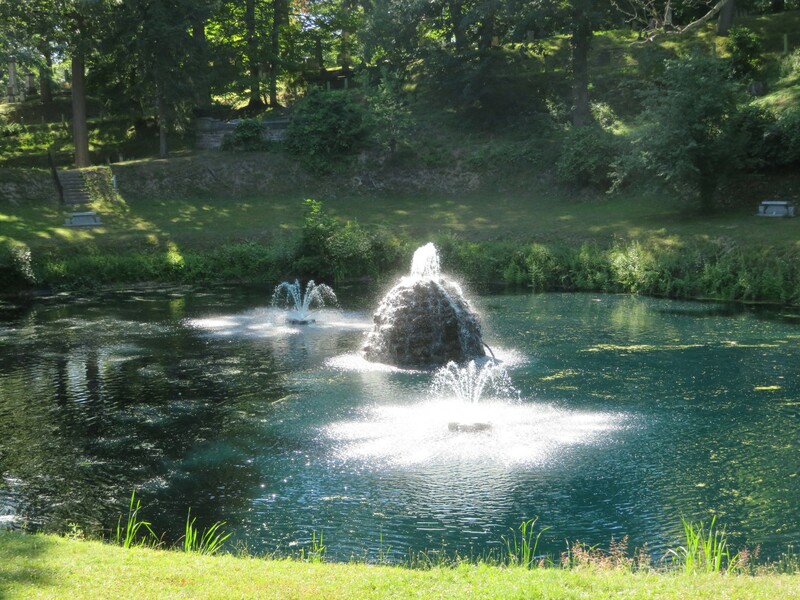 Anne enjoyed nice scenery such as this pond and fountain while I navigated a one-lane road up the side of a hill that would’ve gotten awkward if anyone else dropped in for a Sunday evening cemetery jaunt. 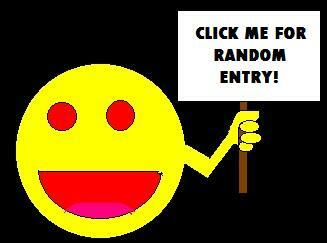 Special thanks to this handy roadside marker and a grave located not too remotely. 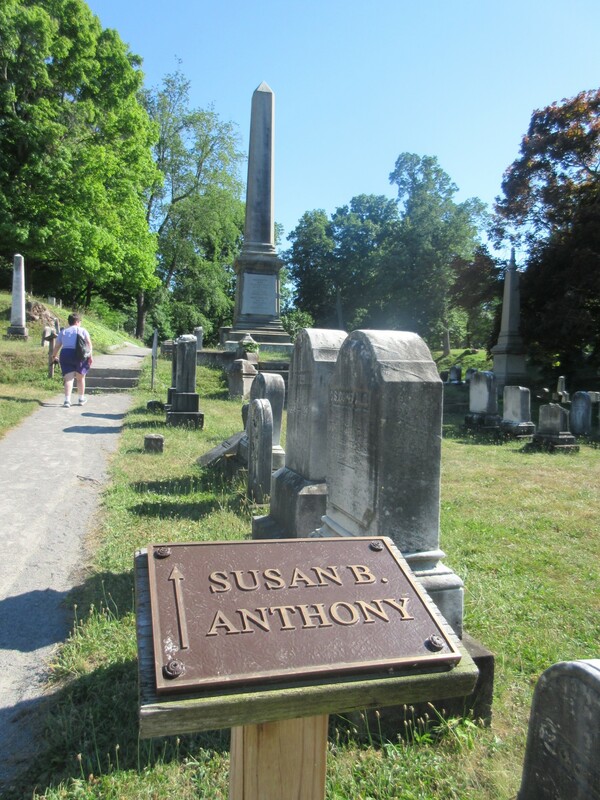 Susan B. Anthony, d. 3/13/1906, age 86. 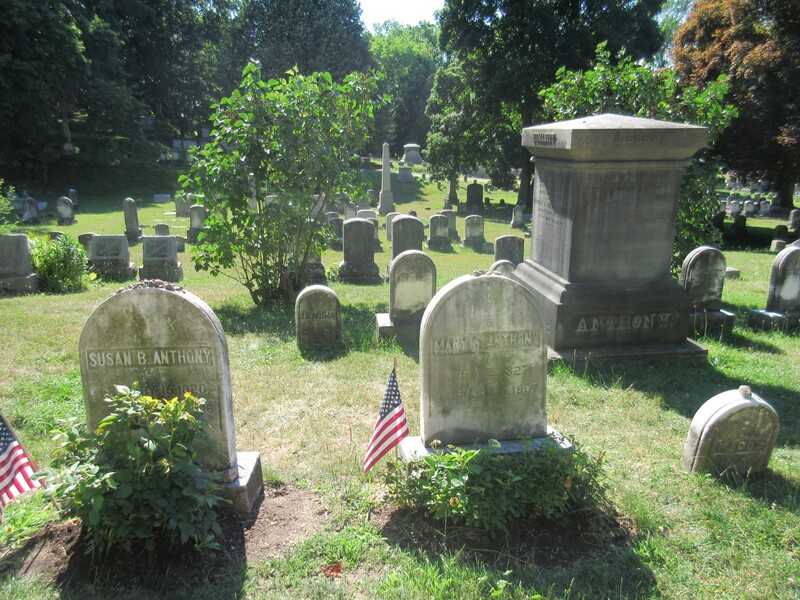 The Anthony family plot. As in life, at her side is her sister Mary. Visible on the larger monument at right are the names of her father Daniel and her other sister Hannah. 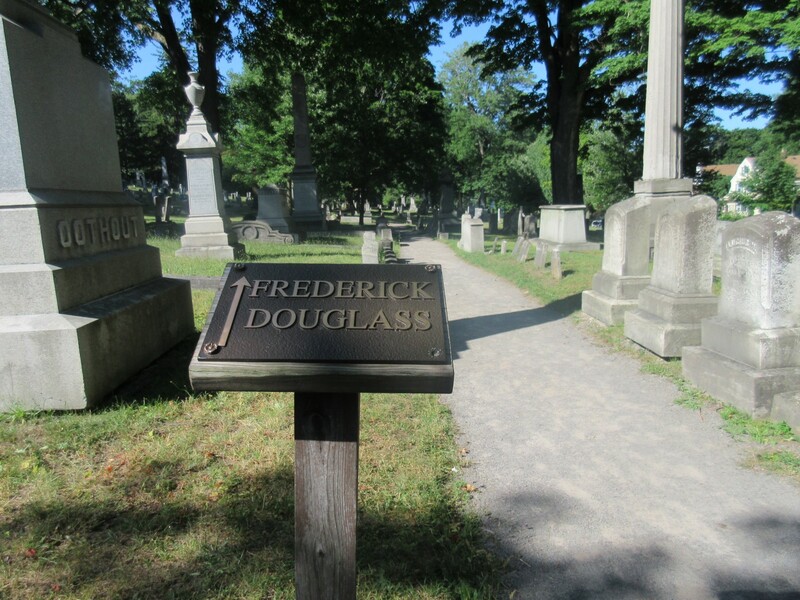 In tracking down Douglass, we learned the cemetery’s official maps indeed lays out all its existing roads, but fails to mention which ones cannot actually be accessed by car. We had to park at an intersection in front of poles barring our way and walk the several hundred feet remaining between us and his site. …and there he was. Frederick Douglass, d. 2/20/1895, age 77. 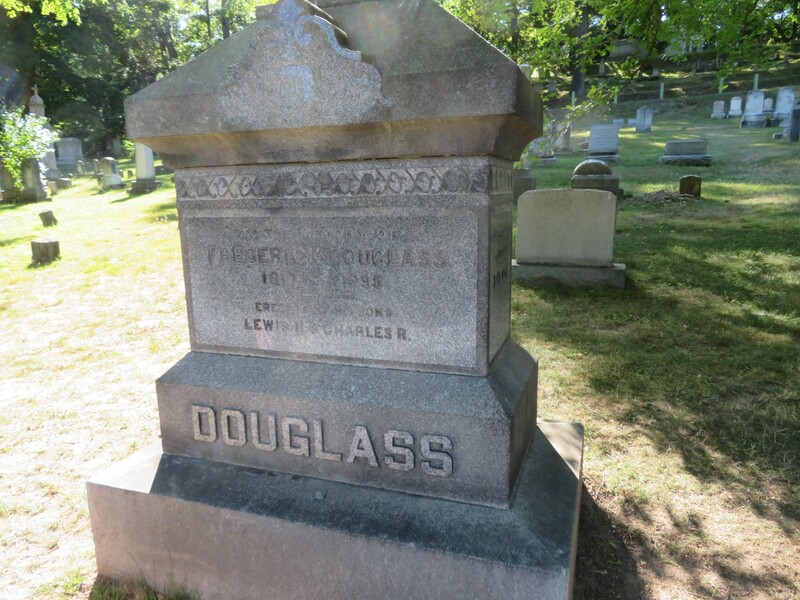 Survivors upon his passing included his second wife Helen Pitts Douglass, who helped found the Frederick Douglass Memorial and Historical Association. Not pictured but equally nearby is his first wife Anna. 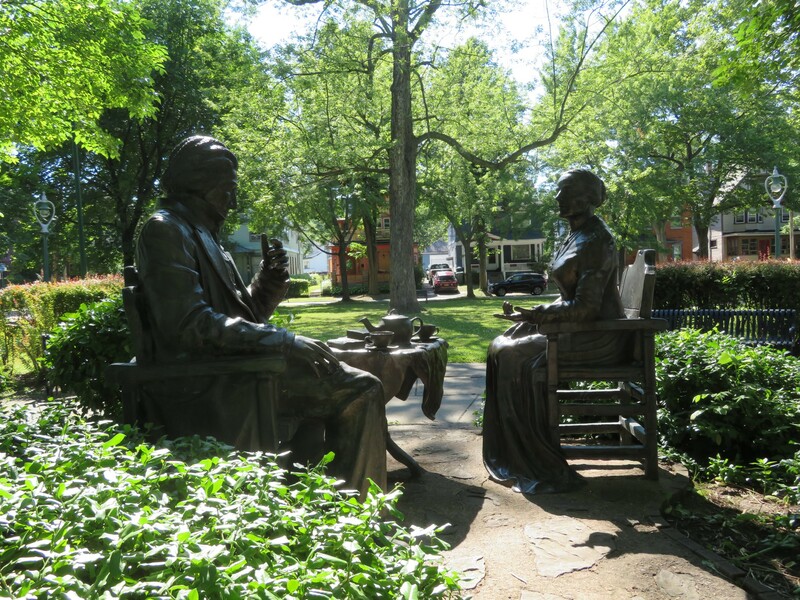 As in life, both women — both of them abolitionists — remain by his side.